In today's tech-heavy society people seem to prefer looking down at a screen versus interacting with others. Bull City Escape, however, offers a chance for players to set aside the mobile devices for an hour and use their wits and work with each other to escape a room instead of relying on Google. The Durham-based business currently offers two game scenarios with a third one on the way, and is proving popular with participants of all ages. "Our escape rooms are fun, challenging, and immersive experiences," owner Alice Cheung said. "They're sort of like real-life video games; in fact, escape rooms evolved from online point-and-click games. However, rather than passively absorbing entertainment form a screen, players actively engage with their team members and the environment around them to achieve a shared goal. They must search for clues, manipulate objects, and solve a series of puzzles, all while a countdown timer looms above, adding an element of pressure to the game." Unless a group is large enough to fill up a game, there's a good chance players may be paired with strangers, which means new friendships get formed at Bull City Escape. Each room is designed like a Hollywood movie set and full of clues such as codes, riddles, and combination locks. Lunar Lockdown is set up like a spaceship's control room while A Study in Murder is set in a Victorian-style parlor. A third game, called Enchanted Kingdom, is scheduled to be unveiled later this year. Cheung has always loved puzzles and was inspired to bring the concept to Durham after participating in an escape game herself. "When I played my first escape game, I knew it'd be a perfect fit for the Triangle and its creative, intelligent population," she said. "In June 2015, Bull City Escape launched in a small, underground room. Word-of-mouth spread like wildfire and within a month, we expanded to a larger location with windows and enough space for 3 escape rooms. We are proud to call Durham home and so grateful for this supportive community." Bull City Escape isn't just for families and groups of friends. It's been booked by couples and offices for team building exercises. The business has also welcomed student organizations and university employees. 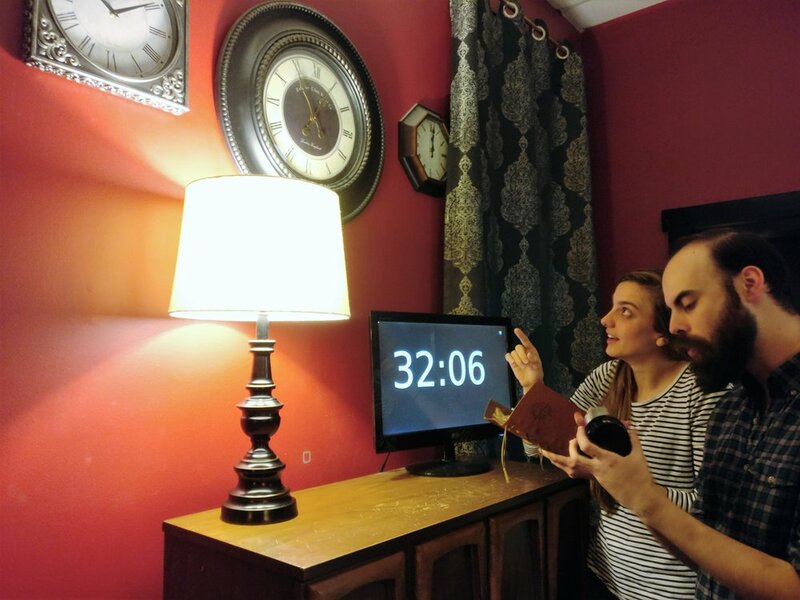 If you're looking not just to escape a room but also escape technology and the world for a while, book an hour of engaging fun at Bull City Escape. DURHAM — Remember the 1990s? Knowledge of the decade might help you navigate the first problem-solving game at Bull City Escape, but immersion in the decade is not necessary to participate in the game, said Alice Cheung, owner of the business that opens Friday, June 5 at 711 Iredell St. in the Ninth Street business district. Teams of two to six people get 60 minutes to search clues, solve puzzles and look for codes to the key that will allow them to escape from the room. The theme of the first game is the 1990s, and the space has paraphernalia from the decade — Furbies, calendars and magazines from the decade, posters of Boys II Men and the Spice Girls, and videos of “Independence Day,” “Sleepless in Seattle” and other movies from the era. Bull City Escape (bullcityescape.com) describes itself as “an interactive, real-life escape game,” recommended for families, companies and groups, and puzzle enthusiasts. Participants can solve the escape puzzles as a team-building exercise, or just for fun. The Herald-Sun | Bernard Thomas (L. to R.) Briles Johnson, Melissa Terrell and Zaina Robinson are looking for clues that will allow them to escape, at Bull City Escape. Cheung played her first escape game about a year ago, and “I loved it immediately,” she said. She has played games in spaces in different cities, all with varied themes — a pirate theme in San Francisco, an office theme in Philadelphia, a warehouse theme in Birmingham. As she played the games, she began wondering, “If I designed it, what would I do differently?” and the idea for Bull City Escape emerged. Cheung keeps a notebook with her in which she brainstorms ideas for puzzles and future themes. Future escape room themes might be a mad scientist scenario, or a combination murder mystery with a “Downton Abbey” feel, Cheung said. She mentions The Scrap Exchange as one example of Durham’s creativity. She also credits American Underground for nurturing entrepreneurs, and the city’s support for small businesses. Before opening the business, she attended seminars on small businesses at Durham Technical Community College, and worked closely with the non-profit Women’s Business Center of North Carolina-Durham, which she called an “incredible” resource for new businesses. Cheung studied psychology and education in school, and brings that knowledge to bear when designing puzzles and games. “All of the puzzles are designed for different kinds of intelligence, so everyone in the group can contribute something,” she said. “The most successful teams are the ones that bring those different kinds of intelligence” to the problems, she said. People who want to play one of the games can show up individually, or as a group. Cheung recommends reserving a time on Bull City Escape website. Cheung said she is open to talking to groups about new themes and game ideas. Looking ahead, one of her dreams is to have a larger space, and perhaps multiple themes in different spaces in Durham. Escape games are “an immersive entertainment,” Cheung said. “You’re not just absorbing something from a screen. … You’re fully present with your team members and you’re working toward a goal” of solving the puzzle.